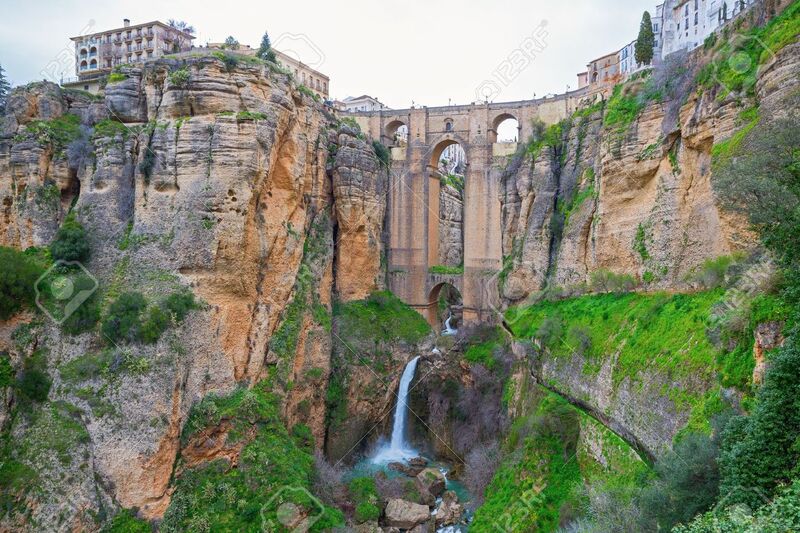 One of the great historical cities of Andalusia, location of the Ernest Hemingway novel “Death in the afternoon”, it is built on both sides of a spectacular gorge. Both Hemingway and Orson Welles were friends with the bullfighter Antonio Ordoñez and Welles was buried on his estate. Cold in winter, hot in summer, best times to visit are spring and autumn. Filled with historical palaces, it has also one of the oldest bullrings in Spain, and in September “La Goyesca” is held here, a bull fight where everyone comes in the traditional clothes of the mid 1800’s. The Ascari race track is located in a beautiful secluded valley near the historical city of Ronda, here guests will experience an entirely new concept in adventure holidays. 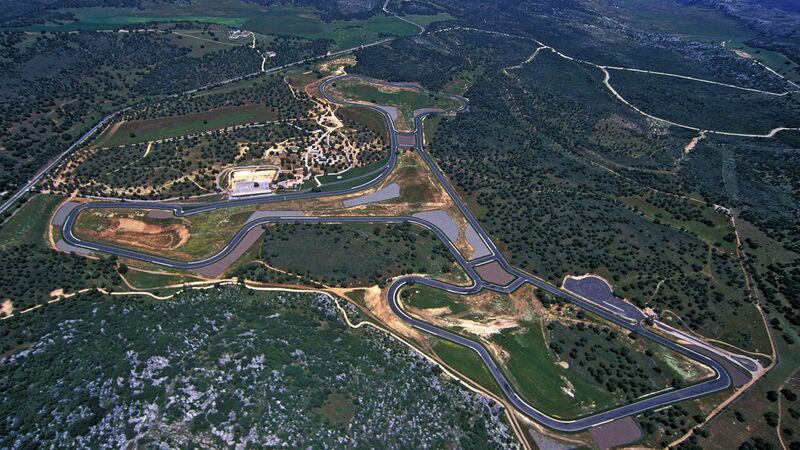 On offer is a 5,425 meter (the longest in Spain) race track providing all the thrill seekers an adrenaline rush, race car rental and a 20 room luxury hotel. Both these beautiful villages are just 20km from Ronda, and lie about 30kms apart. Setenil de las Bodegas is absolutely spectacular with a sheer cliff rising up above the houses and the roads. 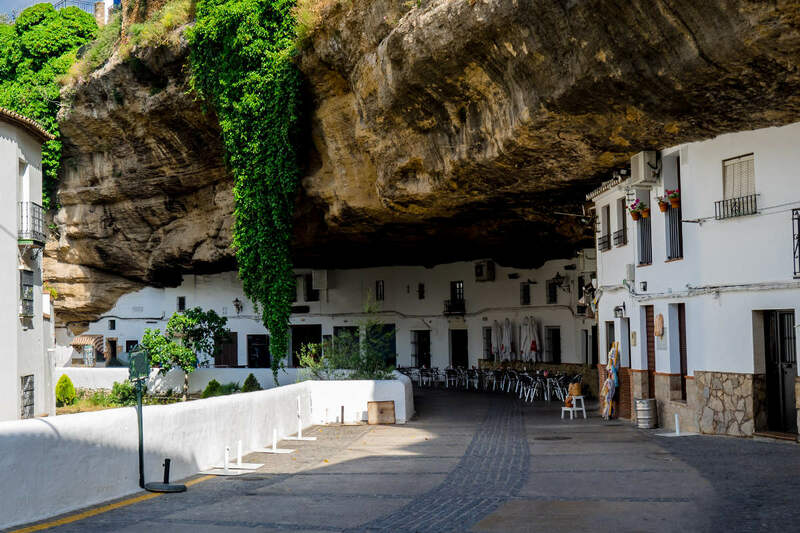 Grazalema is the place in Spain with the most rain fall, but above all, it is one of the best and most beautiful examples of a white Spanish village. 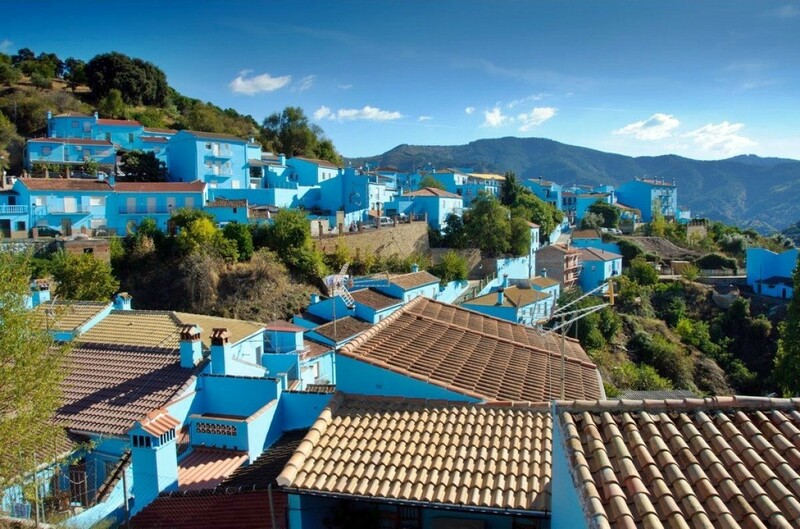 This was one of the white villages until 2011 when Sony Spain celebrated the premiere of the “The Smurfs” film here. The whole village, including the church was painted Smurf-blue, and should have been rendered back to its original state at the end of the year, but inhabitants chose to keep the color because of the influx of tourists. There has been a copyrights discussion with Sony over merchandising, but the village is still painted completely blue. It is worth to do the tour of the Genal valley through Pujerra and Igualeja which shows its beauty best in October when the millions of chestnut trees come in all colors. The mezquita!!! This is, together with the Alhambra, one of the most stunning examples of Moorish architecture in Spain. 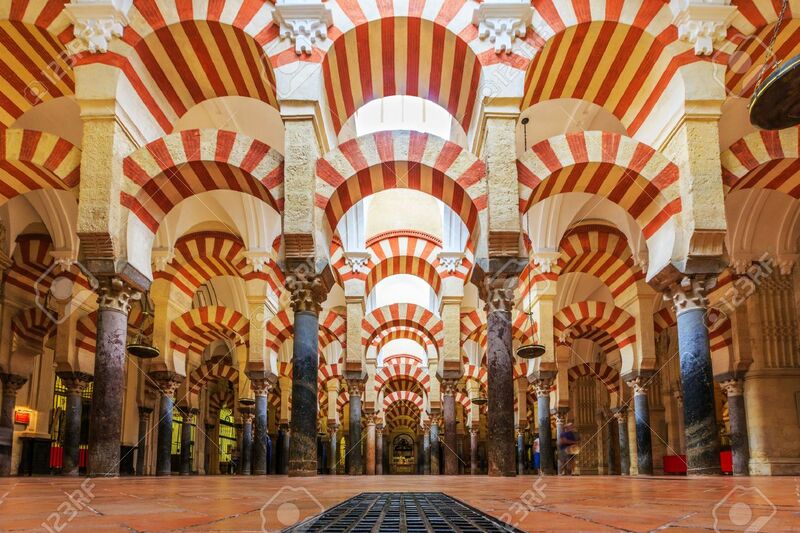 It was once the largest mosque in the world, but when the catholic kings took back Andalucia, it was converted into a catholic cathedral. 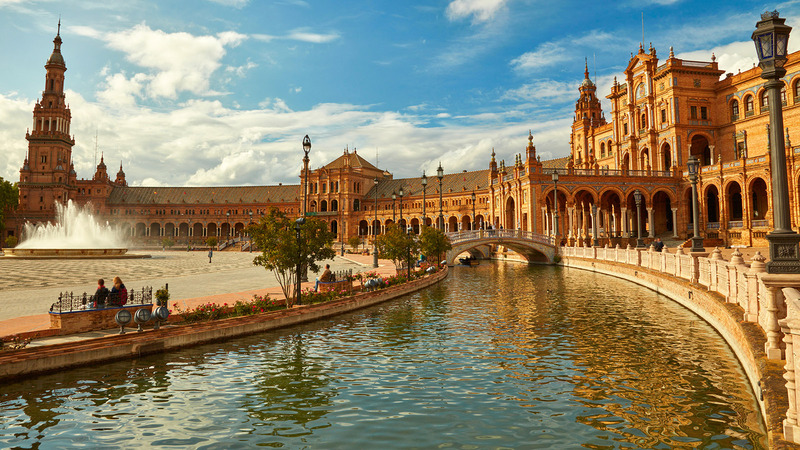 Plenty of the original Moorish architecture is still intact. Cordoba is also famous for its patios, which are all showing their full beauty in May, when the inhabitants compete for the most beautiful courtyard. 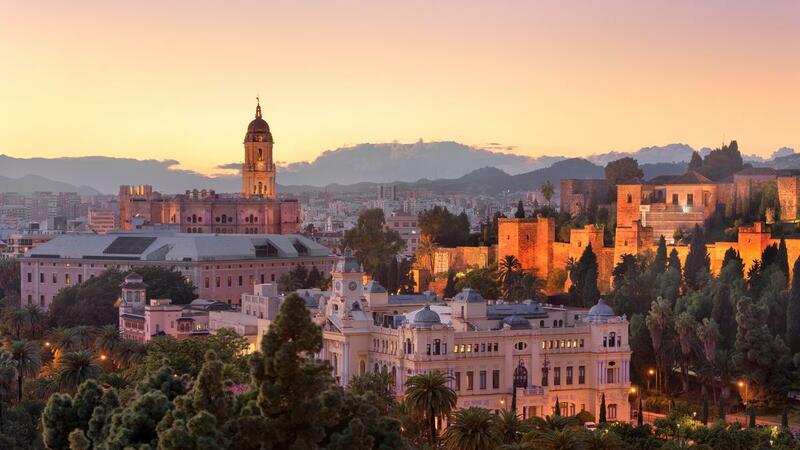 The capital of Andalusia and the major economic centre of Spain after the discovery of the Americas. Magellan departed from here on his world circumnavigation and the valuable materials of the new world attributed to some astonishing architecture. Some of the best “tablaos” ( Flamenco venues) are found in the heart of the city, and Easter week here is simply the best with several processions going through the streets every day. Try to go in spring or autumn as temperatures can rise to 50ºC in summer. 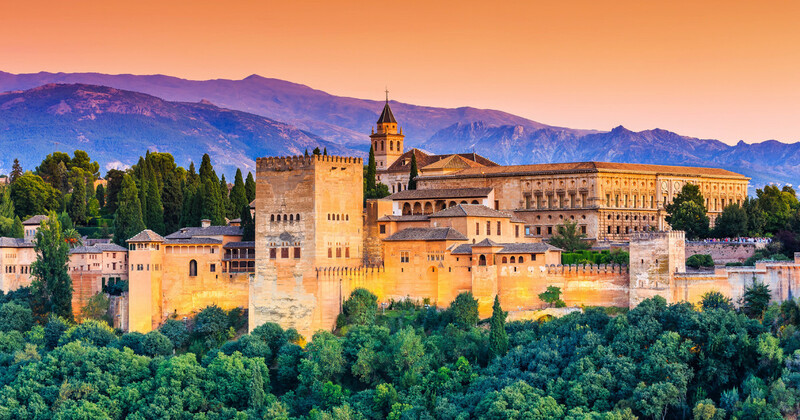 In my opinion Granada is the most beautiful city in Spain, with, of course, the Alhambra and Generalife as the zenith of Moorish architectural elegance. The location of the city, built on several hills with views of the highest peaks in Spain ( Sierra Nevada) definitely adds to its beauty. It is a bustling university city, with nearly half of its inhabitants being students. Sierra Nevada is just 30 minutes from the city and offers over 100km of ski pistes from December until May. Whereas 25 years ago, Malaga was a rather dull place, it has become a really exciting city with various excellent museums and a beautiful old town. The archaeological remains and monuments from the Phoenician, Roman, Arabic and Christian eras make the historic center of the city an “open museum”, displaying its history of nearly 3,000 years. The city also boasts a thriving night life with terraces in the streets packed and local gastronomy booming. The Christmas lighting in the city centre every year is simply fascinating. These three cities are all close to each other, so I have put them together. This is best to do as a two day trip. Jerez is the birthplace of Sherry, and the city has a great number of “bodegas”, the Spanish word for wine cellar. The best known are Tio Pepe and Gonzalez Byass and (nearly) all of them have visited tours of the premises. Although Jerez is one of the lesser known Andalusian cities, it has a vast array of things to see on top of the bodegas, such as Royal Andalusian School of Equestrian Art, the Moorish Alcazar, and the 17th century cathedral. Also, every year the Moto GP circus stops in Jerez, in what is the greatest concentration of motorbikes in Europe. All these motorbikes meet in Puerto de Santa Maria during the GP weekend, so if you want some quiet, don’t go there then. Otherwise El Puerto de Santa Maria is a lively and beautiful town with plenty of fish restaurants and wine bars. Cadiz is regarded as the oldest continuously inhabited city in Western Europe, with archaeological remains dating to 3100 years. It was apparently founded by the Phoenicians. The old town is surrounded by the remnants of the city walls and there are plenty of well-preserved historical landmarks. The city was partially destroyed by the explosion of an storage depot of the Spanish army in 1947. 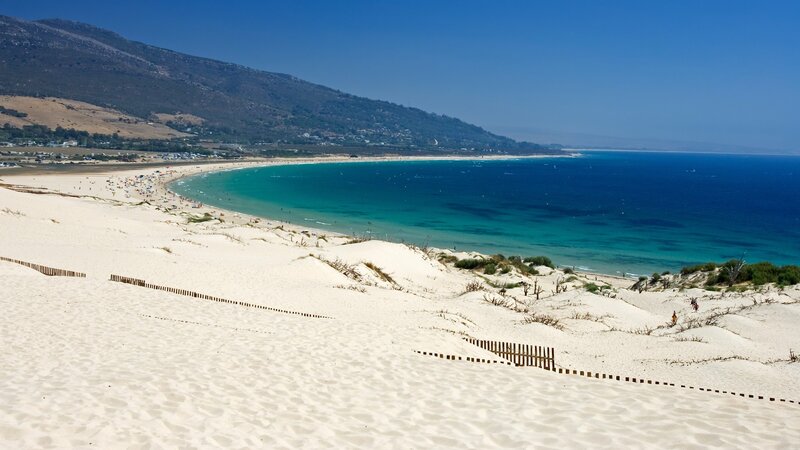 Tarifa is the southernmost point of continental Europe and known as one of the worlds best surf spots, be it wind or kite surfing. It also has some of the best beaches you can find in Andalusia, as they stretch for several kilometers. The walled old town is filled with places to eat and really cool bars and it has an amazingly chilled atmosphere.